Nikki Haley, the US ambassador to the United Nations, shot down speculations of a possible presidential run while announcing her resignation on Tuesday. “For all of you who are going to ask about 2020, no, I am not running for 2020. What I can say is I will be campaigning for this one,” Haley said while pointing to President Donald Trump. Haley, a rising star in the Republican Party, first made national headlines in 2015 as South Carolina’s governor with her decision to take down the Confederate flag from the South Carolina Statehouse. Nikki Haley, the US ambassador to the United Nations and a rising star in the Republican Party, on Tuesday shot down speculations of a possible presidential run while announcing her resignation from her position in President Donald Trump’s Cabinet. “For all of you who are going to ask about 2020, no, I am not running for 2020. What I can say is I will be campaigning for this one,” Haley said, pointing to Trump while the two discussed her resignation and took questions from reporters in the Oval Office. Haley was widely considered to be one of the more moderate members of Trump’s Cabinet, supporting a strong US presence and involvement the world stage. That stands in contrast to hawkish national security adviser John Bolton, who opposes the US’s engagement in international institutions like the UN. Haley said serving as UN ambassador was “the honour of a lifetime,” adding that she didn’t “have anything set” for her next career move. Before joining the Trump administration, Haley was the first female and Indian-American Governor of South Carolina. She made national headlines in 2015 for her decision to remove the Confederate flag from the South Carolina Statehouse in the wake of a mass shooting at an African-American church in Charleston. She was also chosen by the party to deliver the Republican rebuttal to President Barack Obama’s State of the Union address in 2016. 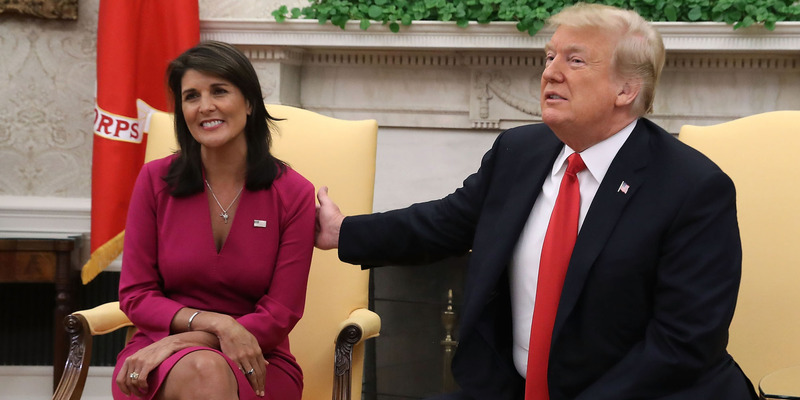 Trump praised Haley for doing a “fantastic job” while announcing her departure, calling her “very special” to him and assuring her she would be welcome back in the administration at any time.